The GeoS-3E, too, belongs to the GeoS-3 Family. This module is specifically designed to meet ERA-GLONASS requirements (GOST R 54620-2011). 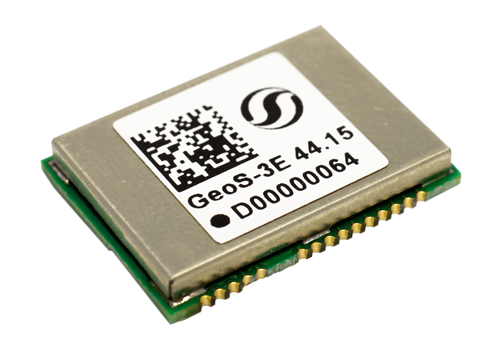 GeoS-3E is based on the low-power G3 GNSS chipset designed by our company. The module is capable of tracking and processing all GLONASS/GPS/SBAS signals concurrently, which is especially beneficial in difficult environments such as urban canyons or under tree canopy. The low-power design allows total power consumption to be reduced down to just 85 mW in active mode. In power saving modes, the power consumption can be reduced even more, to a few tens of mW. Communication with the module is accomplished through a dual serial interface (DUART) that supports NMEA 0183 v3.01 and the proprietary binary data protocol. 1PPS output enables the use of the module in precise timing applications. The module features extra RF input filter, single 3.3 V supply voltage and supplementary proprietary NMEA messages for easy integration to ERA-GLONASS terminals. Modules are offered in 22.1x15.9 mm 30-pad LCC package.